Whenever people mention Kenya as being an innovate country, or Africa’s most innovative country, they will often go ahead to list examples. M-Pesa and Ushahidi. One would be mistaken to think that all these years, nothing much has happened in Kenya, besides the two. That, however is the challenge of cliche presentations, which pick up punchlines from other presentations on the Internet. Until those who first listed M-Pesa and Ushahidi as Kenyan innovations add a few others to their lists - we may have to settle for these two being descriptive enough. Now, I was here to talk about innovation in Kenya. I’ll be talking about much more than M-Pesa and Ushahidi. I happened to be hanging out with a few hardened and debugged developers yesterday, as Ushahidi launched what has been the result of 3 years of effort, a revamped, much more robust platform. I got into a discussion with these developers. M-Pesa was founded in Kenya by researchers from the United Kingdom. The product was modelled off the observation that mobile users in a number of African countries were using airtime as a form of money transfer. They would send airtime to their relatives, who would then redeem it for money. Development was funded by the Department for International Development UK (DFID). 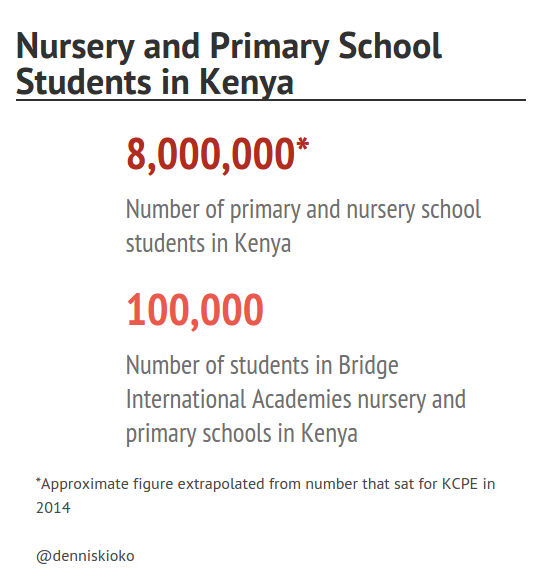 Another of Kenya’s innovative solution, though not as famous as M-Pesa, is a chain of schools known as Bridge Academies. These schools provide quality education to lots of Kenyans, especially in low income areas and at an affordable fee of KSh. 500 a month. Bridge Academies tackles a number of challenges in our education system in an innovative way. Bridge operates a network of 405 nursery and primary schools. 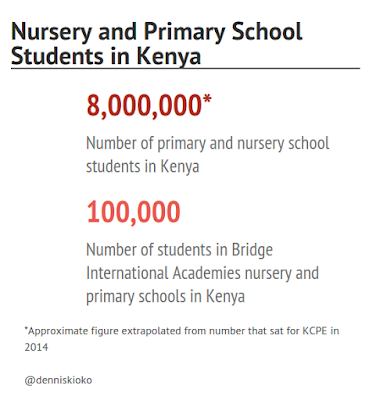 880,000 students sat for the national Kenya Certificate of Primary Education last year, which indicates there are about 8 million students in primary and nursery students in Kenya. About 100,000 of this school at Bridge Academies. How does Bridge ensure that all these students, be they at a school in Mukuru in Nairobi, or one at Mairo Inya in Nyahururu, get the same quality of education? Technology. Bridge Academies employs a host of teachers, who are then provided with tablets. These tablets have lesson plans and content for each lesson delivered via mobile Internet. Thus, each class 8 Bridge Academy student will have undergone identical lessons, and covered the curriculum to the same extent, irrespective of who was teaching them. Technology here, is enabling low cost delivery of quality and standardised education. Automation here, has solved a problem, rather than do what many assume would be the result of deploying tech in education - the replacement of teachers. Bridge Academies is funded by various institutions and individuals, including the Omidyar Network, Bill Gates, and Facebook’s Mark Zuckerberg, all from the United States, and the DFID, again. The founders include Jay Kimmelma and Shannon May. Besides quality education, access to quality and affordable healthcare remains one of Kenya’s biggest problems. Many a public hospital is in much a state of neglect, with problems ranging from a shortage of wards, equipment, medicines, and most of all, staff. Many hospitals also tend to a be a distance away, especially in rural areas. Private hospitals remain few and costly, and even the more affordable ones face the same issues as the public ones. Consultation fee for a single visit in a good hospital will set you back KSh. 3,000. A Cesarean Section birth in a hospital whose name you can’t remember will cost you KSh. 110,000. The minimum wage in Kenya’s capital city is KSh. 8,000. Worlds apart, evidently. Enter AccessAfya. Starting in Mukuru too, The Economist reports AccessAfya now consists of two clinics, which see patients at a consultation fee of KSh. 100. Patients information and records are managed via iPads, and sent and stored in the firm’s headquarters. Inventory software automatically keeps track of medicine stocks, ensuring they never run out. Patient’s get follow up calls on how they are doing, and get alerts when a communicable diseases strikes their neighbourhood to enable them take preventive measures. AccessAfya will soon open 3 more clinics in Nairobi. The NGO behind the clinics is founded by Melissa Menke, a US citizen. Donors include Canada’s Grand Challenges Canada, and the US’s USAID. Notice anything common here? Just like Uber has made many Nairobians find taxis affordable and worth their money, by using technology to not only make taxis more efficient, but to manage a taxi service, so is what is happening in all these sectors. Secondly, all these solutions seem to heavily involve foreign founders, and foreign funding. Kenya’s innovative tech revolution, is being driven by foreigners. Now, don’t get me wrong. I have no problem with foreigners being behind these solutions. After all, don’t we spent a lot of Kenyan taxpayer money chasing foreign investors? My question is why we have to wait for foreigners to ship in innovation. Kenya has a skilled tech sector, including locals who export solutions all the way to West Africa, and even some who have developed solutions for some of the names mentioned above. I have a couple of friends quietly working on their start ups. They are Kenyans, but the funding again seems to mostly come from foreigners. Again, with some of the developers (and other industry players) I was with last night, we came to a few conclusions. For starters, networks. Most of the foreigners mentioned above are educated in leading institutions such as Harvard, MIT, Cambridge and others. They not only have a good education, they have access to other brilliantly educated people, and most of all, to people who not only have the ability to fund them, but believe in them. The US and UK have more capital to run businesses by the mere sizes of their economies. What’s a large amount here is a small amount there, and ends up doing a lot here. Secondly, Kenyans seem to rarely invest in ICT startups. There’s a better return for your investment in real estate, government and other sectors. Surprisingly, even some of the developers I was with admitted that they had invested the money they had made from tech in other sectors besides tech. Related to this, is my mostly fronted argument that Kenyans in general have a poor relationship with data and information. We don’t place much value in collection and storage of information and data. We are a verbal and person-person relation based culture. Many business owners do not know how many customers they handle per month, where these come from, how many return, etc. We simply do not collect such data. If we do not have data, we than do not have an opportunity to learn and improve on what we are doing. Additionally, we are yet to form a habit of automating our businesses. Labour in Kenya remains cheap. As an example, a business will therefore pay 3 employees KSh. 10,000 a month each to do a job, rather than invest in a KSh. 500,000 system which would do what these employees do. We tend to see the cost of automation as an expense, rather than an investment. The problem with jobs that can be easily automated is that they tend to provide no additional value to a business. Basically, you can’t differentiate yourself with your competitors here - unless you serve a niche market that places a premium on hand crafting. Automation increases efficiency by increasing output, standardising output and ensuring it meets a certain quality. Unlike humans, automated solutions do not suffer from mood changes, exhaustion or even distraction. An often overlooked benefit of automation is that it frees up your employees to apply their skills in other specialised areas which add much more value to your business. Mundane, repetitive tasks do not add any value to your business, and you may find, tend to be among the leading causes of customer issues - delays, varying quality, among other issues. If we as Kenyans are to see phenomenal growth in our industry, we must start seeing the potential ourselves. The foreigners investing in IT based solutions in Kenya know tfee possibilities of such systems. Heck, KSh. 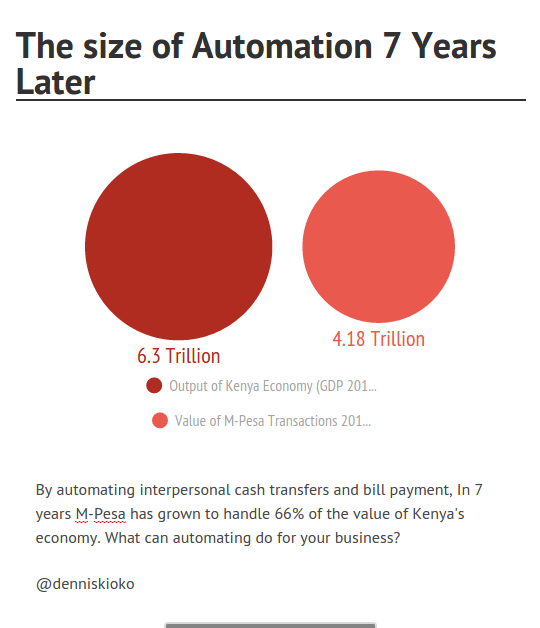 4.18 trillion was transacted in the last year on M-Pesa. Kenya’s economy was worth KSh. 6.3 trillion in 2014. See, this is the value that simple automation of a sector can achieve. It’s time we started automating our businesses, our lives, government and appreciating technology for what it is worth in our lives.